The Adahan – MX-MT 7114 Vacuum Pumps are two stage, piston pumps. The patented crank mechanism provides high efficiency, low wear and small size. The piston “floats” with no side – loading on the cylinder. The piston pumps on both sides with dual pump reliability. The pumping in both directions minimizes internal leakage. The pump is virtually maintenance free, as the bearings are permanently lubricated. The pump is dry and will not contaminate the pumped media. The pump is impervious to moisture, steam and some corrosives. 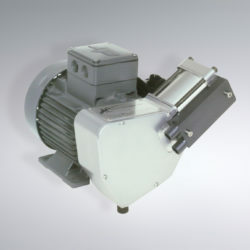 The Adahan –Minimight St. Series vacuum pumps are single or dual stage, piston pumps. The patented crank mechanism provides high efficiency, low wear, and small size. Special chemical vapor pumps are also available. Glass cylinders allow observation of pumped media.